In the annals of deceitful economic analysis, New CBO study shows that ‘the rich’ don’t just pay their ‘fair share,’ they pay almost everybody’s share, written by Mark Perry at the American Enterprise Institute (AEI), deserves a special place. I recently was asked to comment on the AEI analysis for this week’s issue of Too Much, the weekly online magazine about the excesses of the super rich. I was happy to do so, but there’s no way to capture the absurdity of the AEI analysis in a few short quotes. I’ll try to go into a bit more detail here, although even this piece just skims the surface. Based on Perry’s analysis, AEI makes the claim that the rich are really the only people paying tax. What Perry really shows is how unequal the distribution of income in America truly is. Then, for an encore, AEI tries to show that America’s income tax system is the most progressive in the developed world. What the AEI analysis really shows is, well, nothing. Focus on line 5 of the first chart. The first 4 lines in the analysis are taken directly from a Congressional Budget Office (CBO) Report. Line 5 is simply line 4 (taxes) divided by line 3 (total before tax income) and represents CBO’s determination of the tax rate paid in each quintile on its income from all sources. Perry uses this percentage because he wants to base his analysis on income figures that include governmental benefits as income. Line 6 is the heart of the AEI analysis. Perry derives this number by subtracting the average tax burden for each quintile by the average amount of government benefits received. This number is used to create Perry’s second chart. But what does this number signify? Think about it. In each of these quintiles, there is a group of people whose income is all or mostly from market sources (compensation, interest, dividends, etc.). There is a second group of people, mostly retired or unemployed, whose income consists mainly of governmental benefits, such as social security or payments by Medicare to providers of health care. Perry is subtracting the benefits received by the second group from the taxes paid by the first group and ordaining the result of this computation to be the major determinant of whether the entire quintile has paid its “share” of taxes. This methodology is flat-out ludicrous. There’s no logical basis for the implicit determination that the members of each economic strata who work and pay taxes have the responsibility to cover the governmental benefits of non-working members in the same strata. They’re not a family. They don’t even know each other. It’s hard to fathom why Perry thought it appropriate to net the tax payments made by a McDonalds worker in Brooklyn and the Social Security benefits paid to a retiree in Fresno, but that’s essentially what he’s done. Think that’s ridiculous? Don’t worry, it gets worse. Perry’s methodology compounds a quirk in the CBO analysis upon which it is based. The CBO analysis is based on total income, including governmental benefits. Households receiving benefits tend to have less total income than those that don’t. 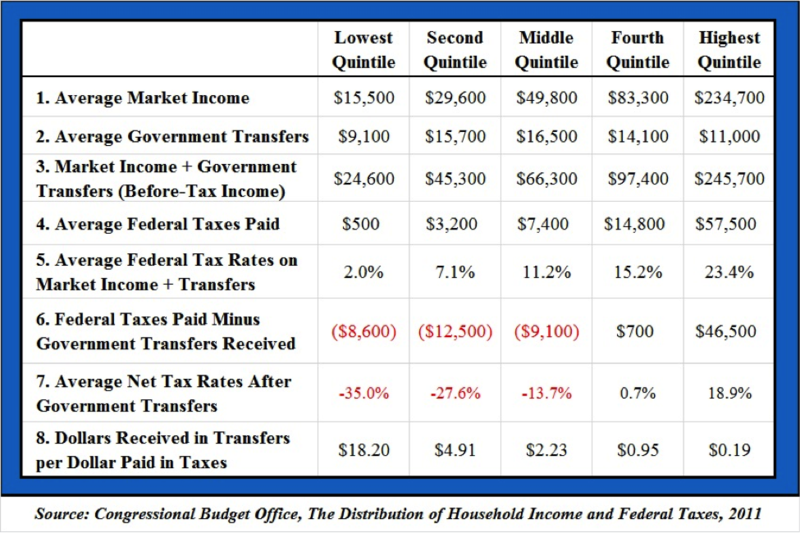 Thus, the CBO analysis loads the lower quintiles with a disproportionate share of households whose income is heavy in government benefits and whose effective rate of tax is lower and loads the higher quintiles with a disproportionate share of households whose income is mostly market income and whose effective tax rate is higher. 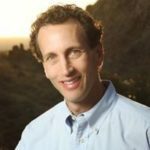 After CBO counts governmental benefits as income, thereby reducing the effective tax rate of each quintile, Perry then factors those same benefits in a second time, treating them as negative tax revenues. This is a radical departure from the CBO analysis. Whereas the CBO effectively treats governmental benefits as income that is subject to a zero tax rate, Perry treats governmental benefits as income that is subject to a tax rate of negative 100 percent. Consider these two households under Perry’s analysis: Household 1 has $9,000 of market income, pays $900 in tax and receives $400 in governmental benefits. Household 2 has $8,500 in market income, pays $1,500 in tax and receives $1,000 in governmental benefits. Under Perry’s, Household 2 has a lower “net tax ratio” than Household 1. But none of this really matters. Why? Because under their methodology the case Perry and AEI make is driven not by tax rates but by inequality. The more unequal things are, the better they are able to make their case. And income distribution in America is very unequal. This is best illustrated by re-doing the AEI analysis using a flat tax rate of 17.4%, the effective tax rate for the entire population on total income according to AEI’s analysis. Shown below is the first AEI chart in this flat tax scenario. An additional line is added to show the effective rate that would have to be applied to the income of each quintile that actually is subject to tax in order to achieve the flat tax rate on total income. * Tax rate on market income needed to result in 17.4% rate on total income. The bottom line is that using the AEI methodology, if things are as unequal as they are in America today, it’s baked into the cake that the rich will appear to be paying their share. Some methodology, huh? And just think of what Perry’s charts would look like if America’s income distribution were even more unequal than it is today. AEI would be in an uproar over how unfairly the rich were being taxed. The worse inequality became, the louder Perry and his friends at AEI would scream about how unfairly the rich were being taxed. It’s a script only Orwell could have written. On to Perry’s “update,” where he tries to show that America has the most progressive tax code in the developed world. How does Perry get there? He computes the ratio of the share of the total federal tax burden borne by the top ten percent in America to their share of total income, then compares it to the same ratio for other countries. For America, that ratio, according to Parry, is 45.1% to 33.5%, or 1.35, which is higher than the average of 1.11 for all developed countries. Sound logical? Well, no. Consider how Perry’s ratio of tax share to income share changes as the income share of the top 10% increases. In a completely equal society, the tax share and the income share of the top 10% each would be 10%, so Perry’s ratio would be 1.00, no matter how progressive the tax rates were. In a completely unequal society, where 100% of the income flowed to the top 10%, the tax share of the top 10% also would be 100%, so Perry’s ratio would again be 1.00. If a country’s tax structure is progressive, there is some level of inequality where Perry’s ratio will be at its maximum. If inequality worsens from there, the ratio will decrease. If inequality lessens, the ratio also will decrease. It is altogether possible, under Perry’s ratio analysis, to have three countries with identical tax rate structures and have the country with the middling inequality level score the highest in Perry’s ratio test. That country would by definition not have a more progressive rate structure, nor would it have either the highest or the lowest level of inequality. Moreover, the shape of a country’s income distribution will impact Perry’s ratio. For example, if the top 1% have a large share of the income of the top 10%, Perry’s ratio will be different from how it would if the income of the entire 10% were shared more evenly. The bottom line: Perry’s tax share to income share ratio is arbitrary. It measures nothing. Why Perry looked to this ratio as a measure of tax progressivity is mystifying. Each developed country’s rate structure is available for all to see. Wouldn’t it be easier just to compare those rate structures? Or did that not get Perry the result he wanted? I’ve seen a fair number of deceitful economic analyses over the years, but this one by the American Enterprise Institute ranks right up there near the top. Update: Mr. Perry emailed me and demanded a correction to the first paragraph following his second chart. He was upset because I had said that he computed line 5 of first chart, when he actually had taken the numbers from the CBO study. Either way, it was a mechanical calculation, so I’m not sure where his complaint goes. Nonetheless, the correction was made. I seem to remember this guy back in the naughts arguing there was no housing bubble and the US economy was super strong because of Bush tax cuts. if, indeed you are referring to me, then i must confess i have no idea what you are talking about. i was a very early voice is calling the housing bubble (and invested accordingly). many of us saw that coming as far back as 2005-6.
if you are not addressing me, then perhaps you would be so kind as to clarify who “this guy” so that we might have some idea of what you are trying to say and to whom you are attributing such ideas? actually, i must confess, i misspoke in my previous comment. social security payments, for example, ARE taxable and DO count toward pushing income into higher brackets. thus, based on the household brackets above, it would appear that round about 80% of households DO pay tax on SS income which makes your premise that those getting SS are not paying tax even flimsier. they are. SS is not the source of the distortion, it’s the progressiveness of the code and the massive progressive benefit systems like medicare. note: yes, medicare is massively progressive. you get the same medicare if you paid fica on 25k or 100k in income but in the second case, you pay 4X as much. when some pay 4 to 8 times what others pay for the same thing, referring to the pricing as regressive is doublespeak worthy of orwell. this argument is a trumped up assumptive fallacy (several actually) used to create a straw man and duck the issues. if one could remove all meaning from a Gregory Hines tap-dance, it would seem like this. mostly, it refutes itself. far from demonstrating the deceit of mark perry, a man to whose character I can personally attest, it is merely an innumerate tantrum of bad political thinking and worse logic. it’s a dog’s breakfast of unfounded populist tropes so dense that picking them apart is going to take some time. so let us roll up our sleeves and begin. In each of these quintiles, there is a group of people whose income is all or mostly from market sources (compensation, interest, dividends, etc.). There is a second group of people, mostly retired or unemployed, whose income consists mainly of governmental benefits, such as social security or payments by Medicare to providers of health care. Perry is subtracting the benefits received by the second group from the taxes paid by the first group and ordaining the result of this computation to be the major determinant of whether the entire quintile has paid its “share” of taxes. this is utterly assumptive. there is no evidence as to what extent it alters the numbers and in which quintiles. it also refutes your own point. it’s odd how you ignore these same people’s movement when speaking of wealth inequality. you see people move from group to group for benefits, but not for lifecycle income. you’re trying to have it both ways and making an inconsistent argument. your points cannot both be true without conceding that only the rich pay taxes. if people earn and pay taxes then retire and take out, well fine, assuming everyone pays their way. but if this is so, then they must also have been in theta top quintile that pays all the taxes at some point. after all, if all the others basically take back out all the tax they pay in (or a great deal more), well, someone had to pay for defense and the FAA and FDA and the courts and the FBI and all the other expenses of government. 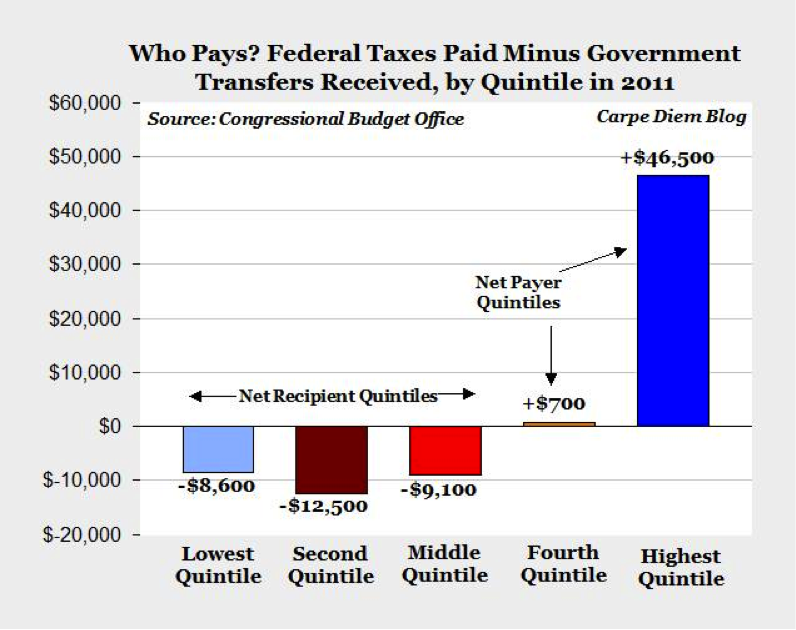 if the other 4 quintiles all pay basically nothing (4th quintile) or get WAY more back (1-3) then ONLY the top quintile pays for the rest of government. thus, you have painted yourself into a corner. either, everyone takes a turn in the top quintile and wealth inequality is simply an artifact of people moving up to and then leaving peak earnings and we have no equality issue, just a curve of lifecycle earnings; or if we do, indeed have persistent inequality, then those people who are, say, trapped in the second quintile their whole lives, wind up taking out WAY more than they pay in over their lives even if they do pay taxes a few years. in this case, the numbers hold as presented. you cannot have it both ways mr lord. either everyone gets a turn at the top, or, a great many people are not paying anything and are, over their lives, big net takers from the rich. this would seem to leave only two possibilities: you either do not think clearly or you are the one passing off a deceitful analysis here. this alone would qualify you for the hall of shame, but, in a determined attempt to prove the case far more rigorously, you go on. let’s have a look at that, shall we? your argument then becomes circular. if, indeed those with low income who pay little tax get more benefits, well duh. that was the point. congratulations mr. lord, you have finally grasped the data. what is ridiculous is not the inclusion of transfer income, but the exclusion of it when speaking of inequality and who pays. if, mr lord, you are willing to accept the premise that putting $10 into the pile and picking up $180 means you paid for dinner, I would very much like to go out to eat with you. I will choose the wine and we shall pay according to your charming premise. then you make simple math errors. one might be left wondering “is the author innumerate?” if you earn $10 and pay 5 in tax, that’s 50% of income. if you earn 10, get 10 in transfers, and pay 5, it’s 25% of income. if that incremental 10 were taxed at -100%, then you would get back $10 making your net income after transfers and taxes 25 meaning you paid no net tax, but instead took in transfers of $20, paid gross tax of $5, and thus, had a net gain of $15. what you meant to say would be that governmental transfers face a tax rate of zero, which is precisely so. yet they are still income. you can put them in the bank and spend them. again, congratulations, we’ll get you to understand the piece you tried so hilariously to critique yet. this is even more foolish. again, if taking money back out does not mean you are not a payer, then I’d love to split a timeshare condo with you. your next argument that this is “all wealth inequality” proves absolutely nothing apart, one more your innumeracy/dishonesty or some mix thereof. it does not refute the point about who is paying one iota. it’s a complete ruse to mask the actual point and a straw man to shift the debate. income is unequal. but this says NOTHING about why and to what extent people move between quintiles. you also ignore how MASSIVE the shifts in numbers you present are. paying $1 to get $2.13 is a far cry from getting over $18 (roughly an 88% drop) and the rich see their return per dollar rise by 84% from 19c to 35 cents. you have just disproven your own point in dramatic fashion. this equality level is MUCH higher. the fact that you do not know what you have just done makes it all the more hilarious (assuming you are honest but incompetent) or more predatory (assuming the obverse). the issue raised was about who takes out and who pays in. your bizarre assumption that a flat tax on income is fair is baseless. if you and I go to buy a burger, we pay the same amount in nominal dollars and call that fair. it may be far less of your income than mine, but that is held of no account in the fairness of “same burger, same price”. yet the lexicon of taxspeak claims that massively disparate payments for the same thing (unincarcerated American citizenship) are somehow fair. no other good or service works like this. only “government” is so priced? why? because the pricing of government is coercive. you may need to look that word up. it is not a synonym for fair. the many can vote to use violence upon the few if they do not pay. burger barn lacks this ability, so they must price fairly. you are simply playing the apologist for this activity. a “flat tax” is not flat at all. it’s massively progressive in a manner that would not be called “flat pricing” anywhere non-coercive. you show this very clearly. what you miss is the clear illogic of “different prices for the same thing = fair”. it’s Orwellian doublespeak that has become so common you have forgotten what the words you are using mean. the idea that my price for citizenship or for medicare when I retire ought to be 1/4th of yours yet I should get all the benefits you do looks laughable when applied to ANY other good or service. ask for life or health insurance this way and see if you get laughed out of the office. try to buy a car or a burger. you have lost sight of the fact that income tax is pretty much ALWAYS massively progressive and puts a much larger burden upon those earning more. this is massively magnified when the primary role of government becomes wealth redistribution. we get into the world so aptly described by Mencken who characterized each election as an auction for goods to be stolen in the future. this is the primary assumptive fallacy of the entire argument de lords and the straw man upon which hangs all your populist appeals: that an income tax is fair. it isn’t. it’s never going to be fair. it’s the wild mispricing of goods. if we join a club and I have to pay more in a year that you pay for lifetime membership, I sure would not call that fair assuming membership has the same privileges. nor is equal income fair. in fact, it’s the height of unfairness. if I make a barely edible mess out of some food and Thomas keller who has spent decades becoming one of the best cooks in America makes and extraordinary dinner from the same food, is it fair that I get the same price for my dinner than he does for his? if I open a lemonade stand and sergey brin starts google, do I deserve the same income? you forget the key point of consensual commerce: people can only get rich by making others better off. if steve jobs did not make you better off by buying an iphone, you would not do it. only by making you better off can he become better off. only by offering you something you value more than the money it costs can they get you to buy. THAT is fair. what does not work like that? government. voting myself the fruits of your labors is not fair. my demanding to be compensated because you are better at something that I am is not fair. can bad quarterbacks demand one of payton manning’s touchdowns? would the game seem fair to you if they could? in a system with unequal ability and motivation unequal outcome is a sign of fairness and equal outcome a sign of a rigged game. it is democracy that is unfair because it carries with it the ability to take without giving. consensual commerce does not do that. by defining the deeply unfair as the baseline for “fairness’ you have twisted the whole debate into some sort of tweedle dumn and tweedle dee semantic mess where words mean what you say they do. but they do not. it’s assumptive fallacy used to duck the issue of fairness and try to shift the goalposts from a fair system to equal outcomes which are proof of a rigged game, not a fair system. you duck the whole issue of who is paying in and who is taking out by making populist appeals, but you leave the actual issue completely intact after your contortions of obfuscation. the top 20% are paying for essentially the whole system. we then veer yet further into this odyssey of illogic and innumeracy. sure, if the top 10% had all income and paid all taxes, the ratio is one and the more closely one converges upon that, the more we close upon one. but the ratio is 1.35, this is the HIGHEST number in the oecd. so, clearly, we are NOT converging upon that point. lots or ratios go wonky around their extreme values. but if inequality were so bad as you claim, the US number would be LOWER than our peers, not higher. thus, your own logic once more defeats him and makes the case for the other side while refuting your own. it also neglects the bad effects of equalizing income on overall wealth. you cannot legislate rich lower percentiles. in fact, those in the EU are not better off that those in the US in terms of real purchasing power parity adjusted income. they have no succeeded in making the poor better off, only making the rich worse off. negative sum games to assuage envy and impede progress are deeply ugly and horridly unfair. then we get yet another excursion into innumeracy and oversimplification. if the top 10% earns the same money and pays the same tax, how is it split in that group has no effect on the ratio at all. let us give you the benefit of the doubt on being able to do 5th grade math (though you shows few signs of deserving it) and presume you mean this will somehow affect the tax rate paid. in this, you are making poor assumptions and grossly oversimplifying matters. one might be led to wonder if you have ever, in fact, paid taxes. simply looking at rate schedules is a laughable oversimplification. only a fool or a charlatan would seek to use such a metric. it ignores the distribution of tax between income and cap gains. it ignores what can be deducted (standard, mortgage interest, etc). it ignores the AMT (which can really bite, believe me). it ignores transfers (though this seems to be deliberate). it ignores the definitions of taxable income and the fact the US taxes global income of citizens while most of the oecd does not or at least, does not do so effectively, which, in actuality, makes the us even more progressive compared to its peers. if a Belgian piles money in a numbered swiss brokerage account, oops, no more taxes. so, their share of income is understated (as no one has the data) and no tax is paid. thus, his taxes paid by income are, in reality, far less than reported. I have seen a number of critiques that demonstrate absolutely nothing over the years save the inability of the author to engage in logical thought and basic numeracy, but, alas, this one ranks near the top. you, mr lord has demonstrated nothing but your own inability to grasp the issues at hand and your determination to misframe the issue to suit your political agenda. When you have staked out a pre-determined outcome, you can run the numbers anyway you want to justify the outcome. Any numbers that refute your pre-determined outcome are ignored or “recalculated”. Does this mean Fox News’s economic “reporter”, Cookie L. Digits will drone on for two weeks about this report. So transfer payments, (I PAID INTO THAT!) are counted twice, as “income” and as negative taxes? However if being rich is such a burden, then I would suggest Perry and Ted Cruz read Luke 18:18. I’m not…I’m not sure you understand how a progressive tax system works. Mitt Romney was forced to release two years of tax returns when he ran for President. On income of around $20 million, he paid about 13%. The good news is that tax rates on incomes over $400,000 has gone back to the Clinton era levels, although the estate tax has dropped from 55% under Clinton to 40%. Also, Obamacare adds on a bit more taxes to high end incomes. The bad news is that we are one Presidential defeat away from reverting to Bush era tax rates, including the final year of his tax cuts with zero estate tax. A group of the extremely wealthy has been trying to get rid of the estate tax now for about 20 years. Democrats have been pretty weak on taxes, but maybe now the “hell no” caucus led by Elizabeth Warren might start speaking up. It’s weird that the most cogent voice in America on high income taxes is Warren Buffet.